Few things are more snuggly and fashionable than this European style “Delise” black French terry cloth tunic length sweatshirt. A jewel neckline and long, loose sleeves ending just below the wrist combine with an exaggerated shirttail hem for the utmost in comfort and chic. White front transfer design with black lettering is cute and sassy. 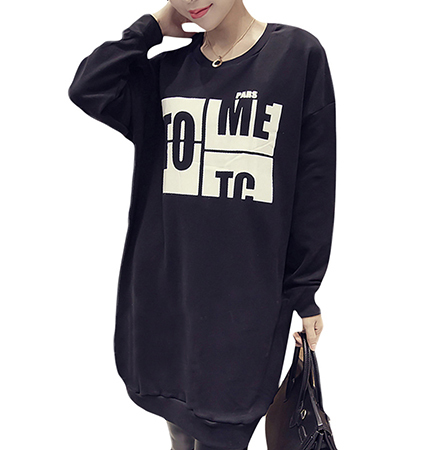 Reaching almost to knee length, this black tunic sweatshirt is great with black jeans or leggings, or for for a twist, try wearing it with white ones and cute high top sneakers or boots. Show your friends why you’re always the best dressed in your social circle.